The following is a three-part afterword for Banneker Bones and the Giant Robot Bees. You don't have to have read the book to read this first post (I'm saving heavy spoilers for parts 2 and 3). I'm mostly going to talk about the book, but I'm also going to talk about race. 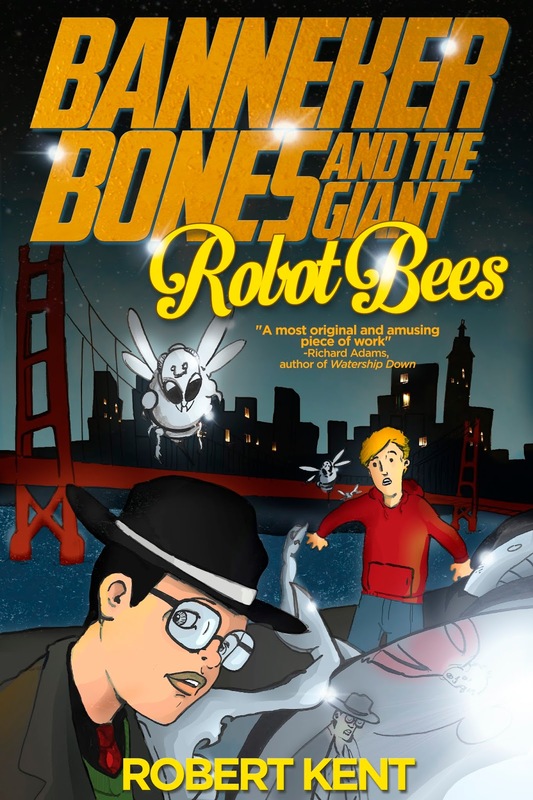 Banneker Bones and the Giant Robot Bees isn't about race. In fact, the story goes out of its way to avoid the topic of race and I have no plans to address it in Banneker's future adventures (I'm well into writing part 2 now), though I have and will continue to address it in books outside of this series. The way I see it, by not addressing race in the Banneker Bones books, I'm making my biggest statement on the subject. I can't tell you where most of my ideas come from--they just sort of come to me, usually when I'm thinking about something else. But I can tell you exactly where I was when I had the idea for this story: Seven years ago, I was driving on Indiana's most boring highway (it's nothing but cornfields and a creepy white church I inserted into my zombie tales) and talking with my future wife about an adult horror book I was no longer enjoying writing. I'd previously written some middle grade books and I'd very nearly had one of them published by a major house (back when there were more than five of them), which let me know I should probably write another. Most every middle grade book I read at that time was a knock off of Harry Potter: likable protagonist with surprising supernatural ability gets word that he/she has been invited to live someplace magical where hi-jinks ensue. Fair enough. This plot was old when J.K. Rowling got hold of it and it's likely to stay with us long after both she and I and all the other writers currently taking a shot at it are gone. Still, reading those books got me thinking. If an owl were to have brought me a letter when I was eleven, where would I most have wanted to have been invited? I was also in my late twenties and a new candidate named Barack Obama looked like he had a shot at being President, which was good because I was a white man deeply and truly and forever in love with a black woman and looking for signs that our one day having a child in traditionally racist America wasn't a terrible idea. It was this line of thinking that led me to start poking around bookstores in search of books our child might one day read and I saw something that had always been true, I just hadn't ever really seen it: the section for books about black kids was sparse and depressing. There are several great books for children of all races written by authors of all races, but white kids have long had a lot more media available to them staring white kids. Growing up white in a small Indiana town, this had never struck me as unusual. I was white and so was almost everyone I knew. But looking at the kids bookshelves as an adult and future father of a half-black child, I didn't care for the looks of all those white kids on book covers as far as the eye could see. The one-shelf selection of books about black kids was mostly books about the civil rights movement and slavery, both of which are important, and both of which make for lousy leisure reading. Where were the books about black kids going to magic school, or riding a giant peach, or touring a chocolate factory? There were books about white kids having exciting adventures with their black friends, but that's not the same thing at all, and there were no books about biracial kids having adventures. Obviously, there is no requirement that the character of a book be similar to the reader. I have enjoyed reading Watership Down numerous times despite not being a rabbit. One reason we read is to gain perspective from points of view unlike our own. Still, for there to be NO books whatsoever about biracial children in the largest bookstore in Indiana's largest city--it didn't sit well with me. And so, getting back to that car ride with my future wife, I was complaining about this very thing and she told me it had always been that way for her. When she was a kid, her father read her Black History flashcards so she would know this country was not built by white people alone. And she always fantasized about one day writing a version of Encyclopedia Brown staring a black detective she'd named Banneker Jones, after the flashcard for Benjamin Banneker. And that pretty well got my wheels turning, because the answer to my previous question was: If an owl had brought me an invitation to go anywhere when I was eleven, I would've picked Gotham City. If that owl came today, I'd opt for a nice beach, but as a child I didn't know that red 'R' Robin wears on his chest may as well be a target and being Batman's sidekick has long been a fantasy of mine--not sure what it says about me that I imagined myself in that role and not the cape and cowl. For more than a year I sat on the story while working on something else, and little by little all the pieces fell into place. I would take the viewpoint of the sidekick, who like me, was a lonely white boy growing up in a small Indiana town trapped in a school he found less than interesting, and I'd make my dream come true for him. And the star of the show would be a biracial boy detective who in many ways is probably a more accurate version of myself at age eleven (my apologies to my poor parents). Ellicott wondered what it would be like to live in a family in which everyone was a different skin color. Most of the families in Brownsborough were all one skin color, including his. Now that he considered it, he supposed it was sort of boring that way. I don't spend a great deal of my time worrying about what it means to be married to a black woman. It's not that "I don't see race." My wife has very nice skin and I like seeing it. Growing up black in Ronald Reagan's America has gone a long way to making her who she is, and that's the person I love most. But usually the only time the subject of our different races comes up is when some external person or situation brings it to our attention and then we remember, oh yeah, that's still a thing for some people. Banneker Bones lives in a world that's moved past all that. He lives in the world I want for my son (but with fewer robot bees). And I'm pleased to say that the real world is slowly moving in that direction, even if it takes forever. Racism will never die, it will only multiply--it's too useful a tool of conformity and social control and we can't realistically divide all people permanently into shirts and skins. But I do think we're approaching a time of a browner, more unified America (it's all of us versus the 1%), and that angry racist buzzing you hear in the media is just old wasps who know winter is coming and their time is nearly done. 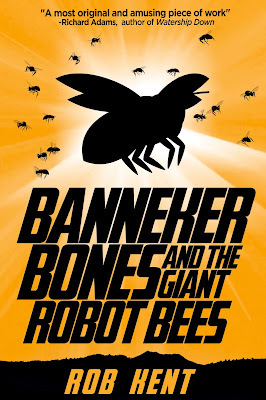 I've been reworking Banneker Bones and the Giant Robot Bees for half a decade now. Of all the books I've yet written, it's my favorite and the most important to me. It's the reason I started this blog and the reason I decided to publish independently. Many individual editors at traditional publishing houses were interested and no one could've fought harder for this book than my agent, Uwe Stender, but you try getting a book about a biracial boy past an editorial board, let alone one written by a white guy from Indiana. The story of Ellicott Skullworth finding a home in Latimer City (I totally used those flashcards for names throughout the book) is the story of me falling in love and finding my own home. 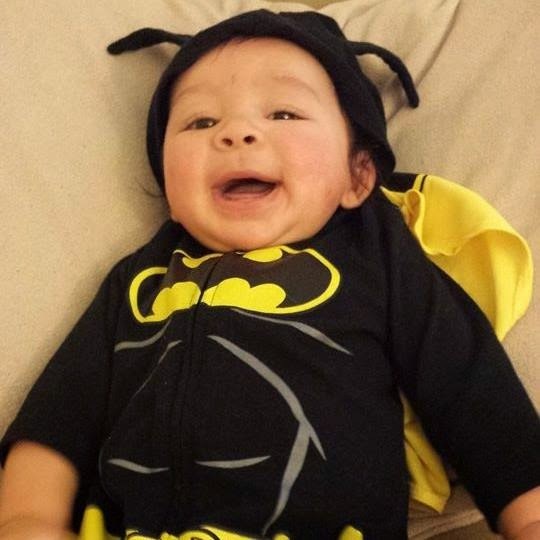 It's a love story for my wife and it's a book written with love for my son. Thanks for writing something our son can find himself in.